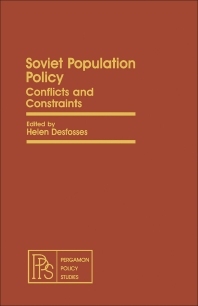 Soviet Population Policy: Conflicts and Constraints focuses on the study of population policy in the USSR. The text looks at the problems identified with population, including migration, depopulation of rural areas, and rapid urbanization. The book starts by outlining the development of Soviet census, considering its purposes and methods involved. The text then proceeds by giving information on population dynamics in which the issue of population is seen as inseparable from political, economic, and social concerns. One of the issues discussed is how military manpower can be affected by the problem on population. Another feature of the book is the sector of aging citizens in which it is identified that the country has experienced an increase in the number of pensioners. In this context, a comparison of the retirement systems of the United States and Russia is presented. The book also looks at the relationship of fertility and female work status in the country. The text goes further by discussing the pro-natalist policies of the country in which the reduction in the psychological and material costs of having children is noted. A discussion on the four models used by demographers to emphasize the issues affecting the population is also presented. The book notes that the country’s position on population is rooted in Marxism. Readers who are interested in establishing the relationship of population with other social concerns of a country can find this book worth considering.